A Single Terrible Choice Faces the Vigil. Hide in Safety and Let Darkness Take Over the Land or Face the Growing Danger and Risk All of Their Lives.Their victory over the dark forces during the feast of Bas-solas should have guaranteed safety for the continent. Instead, Willet and the rest of the Vigil discover they've been outsmarted by those seeking to unleash the evil that inhabits the Darkwater. One of the Vigil has gone missing, and new attacks have struck at the six kingdoms' ability to defend themselves. Worse, a deadly new threat has emerged--assassins hunting the Vigil, men and women who cannot be seen until it's too late. To thwart the perilous new risk, the church makes the drastic decision to safeguard the Vigil by taking the surviving members into protective custody. 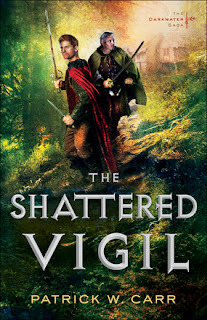 But there are secrets only the Vigil can unearth, and so Pellin makes the heart-wrenching choice to oppose the church in a race to turn back the evil that threatens an entire continent. The Shattered Vigil started off the same way The Shock of Night did for me. I was SO confused for the first few chapters. Not as much as I was with the first one, but still confused. I think I read at the pace in which my minds-eye saw the events unfolding, which was extremely fast. I know, as a reader I can slow down the story, but from the moment you start reading the first page, you know you're on an intense adventure. I think I was halfway through this book when I remembered that the author's first novel had an element of PTSD! You could tell once again that the characters were dealing with it, and in a big way. I also got into a rhythm with reading the book, and at one point couldn't put it down. I kept trying to find moments to sneak in a chapter or two. At one moment I'm worried about what's going on with Willet, and the next moment remembering that Toria Deel was in a crisis. The Shattered Vigil draws the reader in, and hooks them. The characters have become an investment for me, and the urchins have wound their way into my heart. The epilogue though...so annoying! Patrick W. Carr leaves a cliffhanger!! Worst. Thing. Ever! lol I'm pretty sure my words on the last page were, "you've got to be kidding me!" And NOW the wait begins. Thankfully I have the prequel to read at my leisure, and probably get a lot more insight into where this series came from. I think this series is one my oldest son would dive into. He's not much of a reader, but The Shattered Vigil has all of the elements that he loves in a novel. There have only been a few books he's been willing to read the past year or so, and I'm hoping this series will pull him in! It certainly has done that for me! I'm already looking forward (rather impatiently) to book three.